Be the first to share your favorite memory, photo or story of Sally J.. This memorial page is dedicated for family, friends and future generations to celebrate the life of their loved one. Sally Jo “JoJo” Basner, beloved daughter, sister, aunt and great-aunt, and niece went to be with the Lord and her dad in Heaven the evening of Saturday April 13th, 2019 at the age of 52. Sally, the daughter of Meredith Basner, and the late Robert Basner was born on May 26th 1966 in Midland, Michigan. Sally proudly worked for Bader and Sons Co. in Crump MI for 27 years. 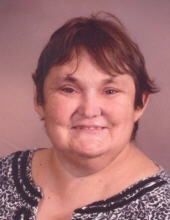 Sally had a great love for her family, bowling, singing at church, and the Special Olympics. Sally is survived by her mom Meredith, sister Barb (Garold) Foor, a nephew Josh (Arlene) Foor and niece Jessica (Evan) Vennix, 3 great-nephews Owen, Logan and Jase, a great-niece Avery, 3 uncles Dewey Basner, Sam (Gail) Basner and Ken Basner and a special friend Sandy Ecker. She is predeceased by her father Robert Basner, Grandma and Grandpa Basner, Grandma and Grandpa Seaman, Grandma and Grandpa Stinchcombe, Uncle Mike Basner, Uncle Harry Basner, Aunt Lorraine Basner, and Aunt Darlene Basner. Family will be present at Rivertown Funeral Chapel in Kawkawlin, MI, Monday, April 15th 2019 from 9-10 AM with the public welcome from 10 AM until the time of a memorial service beginning at 4 PM. In lieu of flowers, the family request memorial donations to go to The Special Olympics Area 9. The family would like thank McLaren Bay Region 2nd floor CCU and 3 West for the tremendous care they provided Sally in the last hours of her life. To send flowers or a remembrance gift to the family of Sally J. "JoJo" Basner, please visit our Tribute Store. "Email Address" would like to share the life celebration of Sally J. "JoJo" Basner. Click on the "link" to go to share a favorite memory or leave a condolence message for the family.